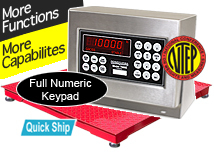 Find superior, quality accurate 4x4 industrial floor scale packages for your business needs. 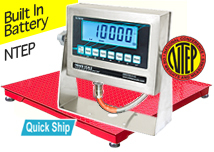 These 4x4 floor scale packages provide accurate results up to 10,000 lb in 2lb increments. 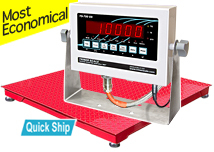 We manufacture outdoor rated industrial scales for sale, as well as NTEP certified scales. 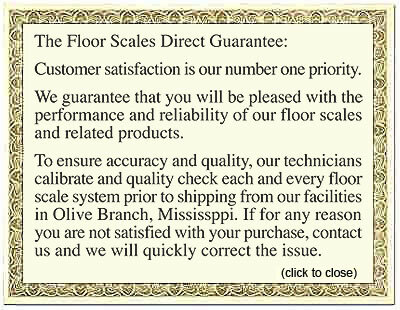 All of our floor scales for sale are shipped free in the USA, and arrive ready to connect. 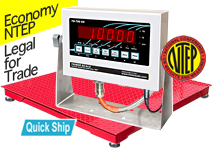 It’s important to be up and running, which is why our 4x4 floor scale packages include all necessary cords and cables, digital indicator and weighing deck, all factory calibrated. Manufactured with heavy duty steel, our 4x4 industrial floor scales are outdoor rated, feature shock absorbent feet, and include 15’ interface cable suitable for hostile environments. These diamond plate top deck floor scales are self leveling, and also include top access mild steel junction boxes. Shop industrial floor scales for sale from Floor Scales Direct, a division of the trusted Triner Scale & Manufacturing Company.